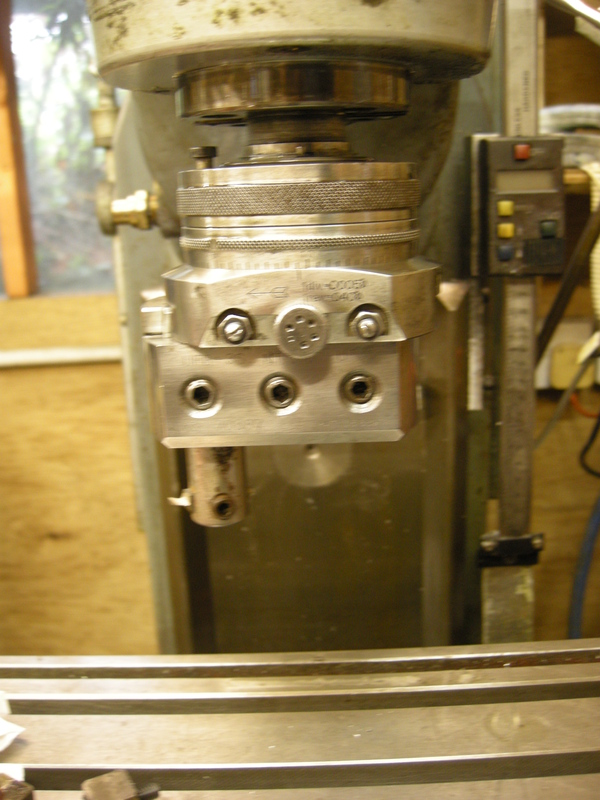 A variation on the boring head is the boring and facing head. This is a boring head in which the tool moves across automatically as the head rotates. This can be used to cut grooves in the inside of a cylindrical hole. It is easy to understand how it works if one considers a conventional boring head. Suppose the boring and facing head is fitted to the vertical socket. For the moment, the spindle is fixed, i.e., not rotating. The boring and facing head happens to have a ring on the outside of its body. If this ring rotates it drives a series of gears that, eventually, make the slide carrying the cutting tool, move out. If we accept there is no reason why such a device could not be made then we can see that the following has to be true. If the spindle rotates and with it the body of the boring and facing head then, if ring is kept still, then the cutting tool will still moves out. To use this device the ring has to be held still. This is done either directly by means of a rod attached to the column of the milling machine or it can be done by holding it with the hand. On the “simple” version when a certain diameter, according to the scale on its body, is reached then the outside ring has to be released. This is done by just letting go of it. On the “simple” version on an internal stop is reached and the user can feel this and lets go. On more sophisticated versions the ring is fixed to the column of the milling machine and when the required position is reached a trip is flipped and the feed stops and becomes disengaged. This can be used for cutting grooves inside a hole. It is constructed like the boring head in that the amount of movement the dovetail can make is limited, just like on the boring head, so there is a series of holes in the slide the cutter can be fitted into. The small, black button on the top surface of the head locks the rotating part of the head to the fixed part. This effectively turns the boring and facing head into a plain boring head. When the head is being used as a boring and facing head the large knurled ring at the top is held by the user’s hand. The bottom ring is calibrated in 0.0005inch divisions and rotates but much slower than the body of the head. The middle buttons allow the user to choose the speed at which the cutter head moves outwards. The stops physically stop the movement of the slide. As the head rotates the top ring rotates freely. When the stop is hit the ring suddenly stops rotating and the user can feel this and should let go of it as this happens. The knob in the middle controls the friction between the rotating rings and the fixed part. The screws are for adjusting the gib. The nuts are for locking these screws. The big hex cap screws are for locking the cutting tool in whichever hole is the most appropriate. 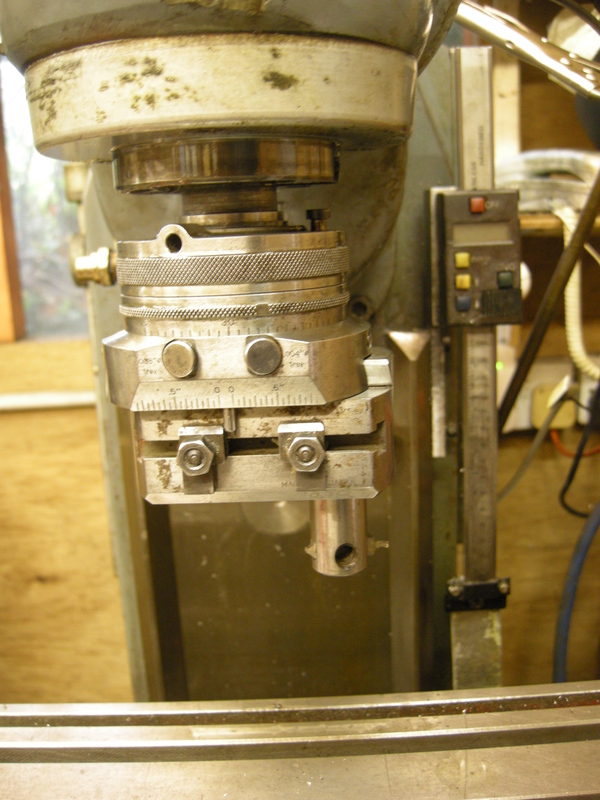 A boring and facing head is far more expensive to make than a simple boring head. This is because the cutter has to move whilst cutting and yet be rigid enough to cut accurately. The sliding fit arrangement is not locked during cutting as it is on the boring head. The boring and facing head shown above contains 14 gears. In the home workshop, the use of a boring and facing head is very limited. It is hard to justify buying one. How can jobs that need a boring and facing head be done without it? It would seem that with workpieces that are small enough to be held in a small lathe it is just as easy if not easier to perform these sorts of jobs on a lathe. If the job is too large for the lathe it might be possible to do it using a boring head and a rotary table (which is described elsewhere).